1. Strength training: Three times a week. Below are total-body workouts with one workout that puts extra emphasis on your legs. 2. Additional cardiovascular exercise: Optional, on non-strength-training days. Examples are cycling, running, swimming, walking, and using cardio machines. An interval workout is recommended for 1 day a week, and light cardiovascular exercise like walking is recommended for 2 of your 3 off days. By alternating between body parts, you'll keep your body in constant work mode and be able to perform the movements back-to-back without rest. Here's why circuit training works so well: You'll save time because you'll cut the amount of rest you need when you alternate muscle groups. More important, you'll keep your heart rate elevated throughout the workout, so you'll burn even more fat while you're exercising - whether it's in the gym or in your own living room. In the first 2 weeks of the program, do the circuit twice. Move from exercise to exercise with no more than 30 seconds of rest in between. When you complete one circuit, rest for 1 to 2 minutes, then complete the second circuit. After the first 2 weeks, when you've become comfortable doing two complete circuits during a workout, increase your workload to three circuits per workout. In every exercise, use a weight that you can handle comfortably for the number of repetitions noted. When that becomes too easy, increase the weight on each set by 10 percent or less. 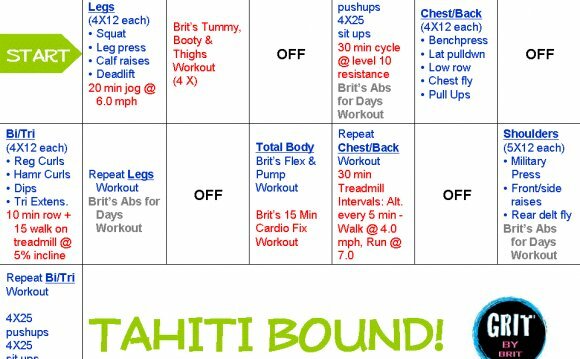 Here's a sample schedule of how you might arrange your workouts. Complete one set of each ab exercise*, then complete the rest of the circuit twice. Complete one set of each ab exercise* once, then complete rest of circuit twice. Complete one set of each ab exercise, then choose one interval workout from our selection.